There is an entire industry, both in manufacturing and in training, which caters to “night fighting” and it gets a lot of attention. Many of these products and techniques are relevant to military and law enforcement personnel. However, outside of the home, low light shooting techniques play an incredibly small (virtually non-existent) part in civilian self-defense. How do I make such a claim? The statistics. 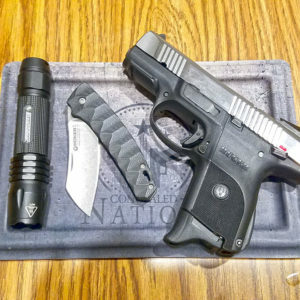 In the research of hundreds of self-defense incidents one is hard pressed to find any that involve utilizing a white light in conjunction with the firearm. Remember, I am only referring to incidents that take place outside of the home, and I am of the opinion that dedicated home defense guns should wear a light, and have a powerful handheld light sitting next to them as well, since in the context of home defense it is a great tool. In this article I wish to provide an analysis of white light techniques that would apply to civilian self-defense when in public places. Even though it is statistically unlikely to be used in actual defensive shooting, I think all armed citizens should carry a powerful hand-held light at all times, especially when carrying a gun. The handheld light proves invaluable for identifying what is around you in the dark, which may mask threats to your safety, a job that a weapon mounted light cannot perform without pointing a gun at unknown parties. If you wish to carry a gun that has a mounted light then by all means do. However, as the statistics demonstrate, the use of white lights in defensive shootings in public places is negligible. Criminal attacks most often occur in “low light” but not in “no light.” Remember that criminals are not vampires, they are people, and they need to actually see what is happening when they attack an intended victim. There is realistically few places that people spend today that have no light at all. The urban and suburban landscape that sees most violent crime is usually lit with ambient light even at night. Sure, if you live in the boonies and the night is indeed dark, then you may rely on your flashlight more, but realistically you will use it as a search tool rather than a fighting tool. With this in mind I believe that civilian defensive tactics with a light should be based around the light being used to simply light dark spaces and identify surroundings. Is it possible that you light up a dark corner in a parking lot and see a criminal actor holding a weapon or threatening you in some regard? Unlikely but possible. Even so, the skill set that we typically associate with night fighting may not be entirely relevant here. 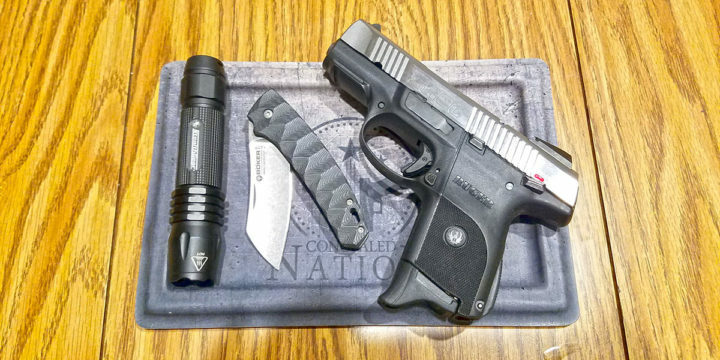 In light of the fact (no pun intended) that the world of civilian self-defense sees almost no use of white light while fighting I am not a stickler for carrying a tactical flashlight all the time as I once was, but I do urge all gun carriers to carry a light. Due to the advances in LED technology it is now possible to carry a 200 lumen light on your key chain. Obviously, a small keychain thumb light, even if powerful, is not going to work well for “night fighting” with handgun techniques such as the Harris hold, but again, back to the fact that this is virtually non-existent in civilian life. I know my suggestion that a tactical light is not necessary flies in the face of modern gun culture collective thought, but show me where and when civilians have engaged bad guys while in public with the simultaneous use of a flashlight and maybe I will change my mind. 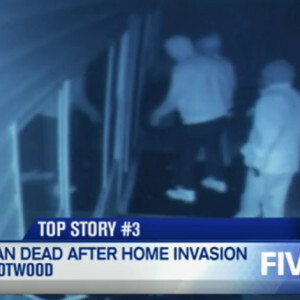 Again, I am only speaking to the use of white light outside of the home, it is more applicable in home defense, but we simply don’t see it play out in public. Until then I stand by my suggestion that the light is a valuable tool that should be carried, but it is realistically a search and identification tool rather than an engagement tool for the armed citizen. So with the realization that we will use our light to identify things or to simply navigate our way in the dark, how should we approach using the light in a defensive manner? Well, let’s approach the skill set that we would use according to the actual circumstances we will likely be in. The fact is that as civilians we are usually not justified in having a gun already in our hand when in public just because we have a bad feeling about something. It is also hazardous to be holding your un-holstered gun just because you suspect there might be an adversary lurking in the dark if you have not clearly identified that risk. The reality is this: if we need to engage a threat that we have just identified with the use of a flash light, we are going to do so from the obvious starting position: flashlight already in hand, gun currently in the holster. 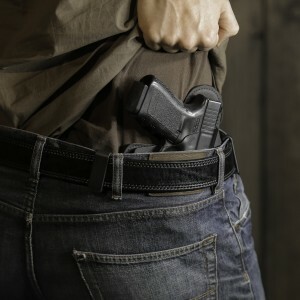 For this reason I find techniques such as the Harris or other techniques that tie the gun and light hand together limited in applicability for the civilian while outside of the home. If in a home defense situation with no light mounted to the gun such techniques are completely viable and they serve a purpose if barricaded in the dark awaiting the approach of home invaders. It is also applicable if needing to shoot around a barricade on your dominant side where a light indexed near your neck or head will not work well due to the barricade. But walking through a parking lot with your gun and light in hand in a Harris hold, pointing a gun at everything you view? No. There is limited applicability here. My suggestion is to approach your light techniques according to this reality. First of all, be sure to carry your light in your support hand so that you have your dominant hand free to access your firearm just in case you do become a statistical anomaly. A light technique that keeps the gun and light in separate hands is going to be more applicable to the civilian. A small keychain light will make such techniques more cumbersome, but it can still be done if bright enough. Such a light hold relies on shedding some of the light’s ambient spill onto the sights of your handgun. I find that I can shoot well in no light with a gun and separate light if I do employ the Harris technique, but going from the starting position of only light in hand to placing that light on the opposite side of your firearm as you draw is a task that is difficult to do safely and efficiently. It also simply takes more time than drawing your gun and immediately engaging the target that you already have the light fixed on. I find that holding your light at about cheek level will illuminate the target and also throw enough light on your gun sights to make consistent hits. Like all skills, it takes training and practice to become proficient. Carry a light that has decent power and practice engaging targets with your handgun while holding the light in the realistic searching position that you will be using. These skills will be more applicable for any night fighting you may need to do as an armed citizen. The light is a very valuable tool to find your way in the dark and to positively identify threats, so carry one. Salvatore is a firearms instructor, competitive shooter, and life-long practitioner of concealed carry. Salvatore actively trains and refines his own skills and understanding of the defensive handgun and strives to share his experience with the growing community of concealed carriers who take their own self-defense seriously. 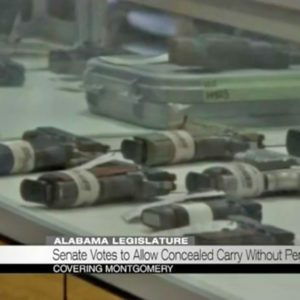 His daily carry gun is a Glock 19 worn in an Alien Gear Cloak Tuck holster. 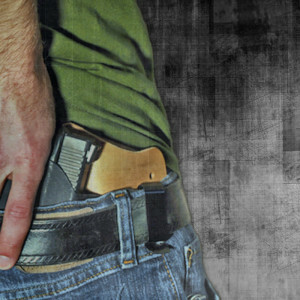 Putting On Your Rig: Do You Put Everything On Together, Or Holster First And Then Firearm?